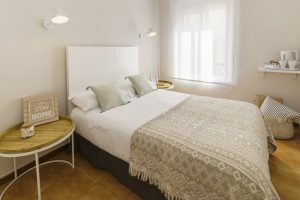 The Premsa by Pillow is a hostel located 4 minutes walk from the beach and in the center of Arenys de Mar. Hostel recently renovated, is without a doubt a perfect place to spend a fantastic holiday with your partner or family. 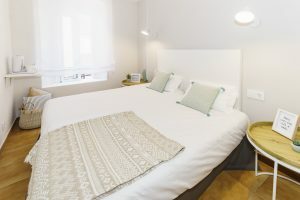 The train station which is only 5 minutes from the Premsa by Pillow – which connects Arenys with Barcelona, the Barcelona Airport makes La Premsa by Pillow the ideal place to get to know Barcelona and other nearby towns, enjoying fantastic ones beach vacation and relax. Maresme neighborhood, the area has sea and mountains, being close to the Montseny massif and the natural park of the Montnegre Corridor. The rooms have flat screen TV, electric kettle, air conditioning, full private bathroom, hairdryer and refrigerator. With free internet connection free throughout the hotel. The Premsa by Pillow has double, twin, single rooms and an apartment for families. Our multilingual staff will be happy to assist you and help you by providing tourist information about the area so you can have a perfect stay. 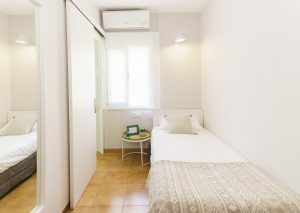 Come and enjoy some relaxing days at La Premsa in Arenys, your ideal hostel! Rest, relaxation and beach time at La Premsa by Pillow Hostel bright, spacious, fully-equipped rooms.